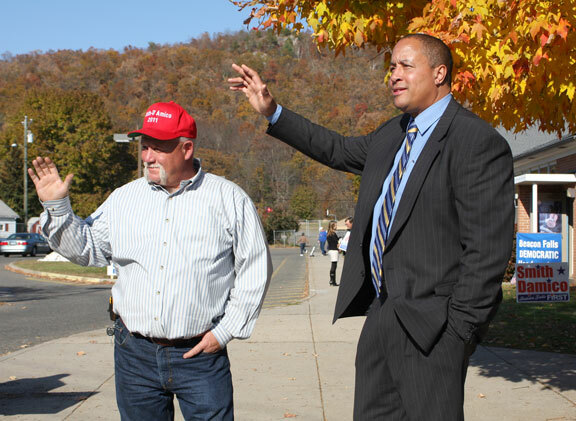 Republicans David D’Amico, left, and Gerard Smith wave to voters outside Laurel Ledge Elementary School Tuesday. Smith won the first selectman seat and D’Amico won a selectman seat. BEACON FALLS — Republican challenger Gerard Smith defeated Democratic multi-term incumbent Susan Cable with about 52 percent of the vote to become the new first selectman of Beacon Falls. Smith garnered 1,024 votes to Cable’s 927. Cable will not serve on the three-member Board of Selectmen as both Republican David D’Amico and Democrat Chris Bielik earned more votes, meaning the new board will be comprised of no incumbents. Smith said he felt the difference in the election was the citizens’ desire for a fresh Board of Selectmen. Smith, who had served previously as a minority selectman and the chair of the Board of Finance and the Planning and Zoning Commission, ran on the platform of fiscal responsibility and transparency. He will be joined on the Board of Selectmen by D’Amico, who received 990 votes, and Bielik, who garnered 961 votes. Cable, who was seeking her eighth term as first selectman while promoting her experience and ability to secure grants, will not be in Town Hall for the first time in over a decade and a half. Unofficial numbers showed that 1,971 of the town’s 3,758 registered voters cast ballots. That 52 percent turnout is better than usual in Beacon Falls, but Smith was not surprised. In other races, Republican Michael Krenesky defeated Art Daigle for treasurer while Democrat Millie Jurzynski beat Republican Ed Groth for tax collector. Cross-endorsed Priscilla Cretella and Democrat Wendy Oliveira won the two open seats on the Board of Education, both defeating Republican John Blesse. 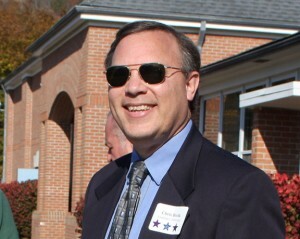 Democrat Chris Bielik greets voters outside Laurel Ledge Elementary School. Bielik won a seat on the Board of Selectmen. Democrat William Giglio and Republican Douglas Bousquet will both serve on the Zoning Board of Appeals while Republican Kathy Brown defeated Democrat Carolyn McMahon for a spot on the Board of Assessment Appeals. Democrat Lou DiPiro ran unopposed for a position on the Board of Finance, and both Republican James Moffat and Democrat Erik Dey earned spots on the Library Board of Trustees.